Known as @AmFamJack on Twitter, Jack Salzwedel is active on social media and blogs about leadership and innovation topics on his “Beyond the Tweet” page at jacksalzwedel.com. Among the topics he’s written about is Walking the Gemba Walk, which he also mentions in the accompanying article. The Japanese term Gemba “means the ‘real place,’ and it is used to represent where value is created closest to our customers and where we can go to understand the truth about our business,” he reveals recounting his first Gemba walk. 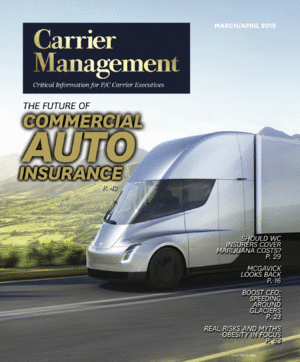 Salzwedel also wrote an article for the May/June 2018 edition of Carrier Management, “What I Use My Voice For,” a personal reflection about how bullying of a childhood friend and other examples of harassment have driven him to use his voice to support those whose voices have been diminished or silenced by fear, hate or discrimination. Beyond that “‘Finding my voice’ is about more than talking about business topics. It’s about building culture, demonstrating integrity and being clear about doing business in the right way—always,” he wrote. Jack Salzwedel, Chair and CEO, American Family Insurance: I’m definitely aware of this concept. The idea that “culture eats strategy” is a not-so-subtle implication that significant, strategic organizational shifts are hard—maybe impossible—to attain when dated, legacy cultural behaviors are allowed to fester. Quite simply, the necessary shifts in strategy die on the vine because the “old culture” drags on any forward momentum toward positive change, new ideas, etc. In the past, when I’ve heard people say these things about culture eating strategy, I’ve cringed. People who make up an organization are the culture…not people who long ago left but whose views or methods may still permeate an organization. At American Family Insurance, we’ve been deliberate about culture. We’ve recognized its importance and built culture into our strategy. Because I believe strategy can be looked at as something that feeds cultural change, not just something being eaten by culture. Do you see the subtle difference in this thinking? We created a culture statement and began doing the work to adapt as an organization to the monumental shifts in our industry and our customers’ lives. This has been an important opportunity to change how we work so we serve our customers better. Adaptation—and winning—is fostered through smart and aggressive strategic planning. And it doesn’t—it can’t—get mired in meetings, silos or outdated beliefs that culture can sometimes “eat.” Being strategic is about focus. Hone in on activities to advance your organization. Map a solid future through a smart strategy. Trust and empower committed and talented people. Execute, but be ready (and set up) to adapt quickly. We’ve made tremendous strides in the last five years at American Family because of our culture—one that emphasizes courage, trust, humility—all for the benefit of our customers, company and employees/agents. Salzwedel: At American Family Insurance, our culture is infused with our values and our beliefs in how we best serve our customers, how we show up in our communities, and how we work with and treat each other. We use the term “OneAmFam” to describe this approach. We hashtag it in the very public way we talk about our culture on social media. It’s a strength, and we’re proud of it. It’s been an evolution—one that combines our long history of serving customers for more than 90 years with the realization that those same customers have changing needs that we must respond to rapidly. Our culture drives that, but it’s also reinforced by our unique strategy in the industry—one that combines best-in-class agents with best-in-class online offerings. This requires agility and tremendous cooperation across our enterprise. We’ve made structural and people changes based on the shifting needs of our customers, and we’ve embraced technology innovations, creating a Digital Transformation Office to help guide our decision-making in this area so it best serves customer preferences. We couldn’t do any of this without also advancing our company culture. Salzwedel: We’ve sown seeds of change at American Family over the past decade, and we’re seeing them grow. Any CEO would be thrilled with just a few of our recent accomplishments and the growth we’ve experienced the past five years or so. But that’s not enough. It’s not enough to have high customer satisfaction numbers, great growth and to be as financially strong as we’ve ever been. I really believe that it’s a hollow victory if we aren’t also a great place to work for our employees and agents—and a catalyst for positive change in our communities. So we’ve provided a terrific, best-in-class employee experience for our people—enhancing and reaffirming our commitment to a flexible work schedule and environment and generous employee benefits. We’ve doubled down on our philanthropic support for the communities where we live and work. We’ve embraced the diversity that best represents our customers, and we’re bringing in the people and leaders who can best serve those customers. And we’re investing to help our agents be more effective business owners, helping them grow and become more profitable. These are the elements that drive us forward as an organization: Creating a culture that authentically values our people and our communities. Our workplaces are also more collaborative than before, and we’re experimenting with innovative ways to interact with one another, as well as providing opportunities for remote work. And perhaps most important of all, we’re committed to a diverse and inclusive workplace, where everyone’s ideas are welcome and courage, curiosity and humility are valued and expected. An article I read recently noted large companies may not be as well positioned to retain top talent as small businesses. Pay and benefits are certainly important for employees—and large companies enjoy advantages in this area. But don’t we also value flexibility and creativity? Isn’t it also important to know we make a difference and support a meaningful purpose? These may be just as—if not more—important as pay and benefits. We can and will do both. That is not just the culture our people deserve; that is the culture everyone should demand. Salzwedel: We each have the ability to choose how we approach our daily lives. What will you choose? I like to ground my attitude and actions around gratitude, optimism and belief. With gratitude, I’m reminded how thankful I am for the accomplishments my company has made together. But really, every organization should have reasons to be grateful—whether you’re the CEO, a manager, a front-line employee. The idea behind optimism is that tomorrow will be better than today and we all can have an impact on it. Optimism isn’t blind or naïve. Understand the issues you must tackle and work on them together. And I have a strong belief in the people in my organization. We are better than we’ve ever been. And now is the time to realize our potential, harness it and use it to our advantage. Those are three pretty simple words, but they carry significant meaning for me—and for the work I can do as a leader at American Family. It’s how I choose to see the culture at our organization, and I convey this simple approach in how I work, communicate, lead. We’ve also put a significant emphasis on culture, developing a strategy that supports it—with the customer at the center of it all. We’ve created a culture statement, which we reinforce in everything we do. This “OneAmFam” approach, as we call it, is a guiding principle in how we do our work, interact with each other and our communities, and most importantly, how we serve customers. Salzwedel: Culture is something that everyone must embrace—no matter your job title. We don’t have that specific role, no. I often say, “We are the culture at American Family.” And what I mean is, any one person can influence culture. It’s not just the CEO’s job, or senior leaders, or even front-line managers. You don’t need a specific title to influence culture, and that’s especially true at American Family. We’ve employed lean startup practices that put our people in key decision-making positions…That’s not something you can do without first empowering your people through culture. Our leaders take Gemba walks—myself included—to see this work firsthand but also to reinforce how everyone has a role in creating the culture we deserve at AmFam. Grasping the current situation and witnessing how the work is done enables leaders to coach employees to be more effective problems solvers and to make better, more informed decisions. This fits with creating the culture we deserve at American Family. It supports the beliefs and behaviors that show how we work with each other, make business decisions and take care of customers. It’s also one of the lean tools that help us identify and get rid of waste, speed up how we serve customers, and lower costs. Making sure your strategy drives your culture—and not the other way around—is a relevant message for any leader. It’s also a call to action for everyone in your organization to challenge traditional ways of thinking…to embrace change you’re seeking, whatever that may be.